Uisce Beatha, pronounced ish-ka-ba-ha, takes its name from the ancient Gaelic for water of life, from which the word Whiskey itself originates. This Whiskey is the brainchild of two entrepreneurs who founded a spirits company to produce blended Irish Whiskey that would define what an Irish Whiskey can and should - A fine sipping dram with a concentration of flavours and no hard edges, offering smoothness and delight. In its short life-time this blended dram has already won numerous awards worldwide and acclaimed a reputation for being an all-around drop that calls for any occasion. 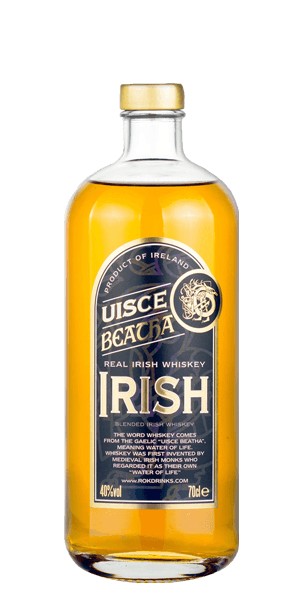 Uisce Beatha Real Irish Whiskey is a blend of single malt and single grain Whiskey that was matured in casks that held Bourbon before. Although it has a pretty pervasive character for such a young contester, it is an easy rider on the palate and the senses. You be the judge! What does Uisce Beatha Real Irish Whiskey taste like? The Flavor Spiral™ shows the most common flavors that you'll taste in Uisce Beatha Real Irish Whiskey and gives you a chance to have a taste of it before actually tasting it. Vanilla, toffee, malt and chocolate its sweets all the way with this one. The vanilla stays and the presence of oak and toasted wood comes in the forefront. The raw character of grains and malt is felt in the intermediate conclusion of sensations. Grain, Cereal, Oak, Sweet, Fresh, Vanilla, Charred, Orange, Delicate, Citrus, Toasty, Fudge. Very smooth. Neat is a great way to have this. Very smooth great sweet taste. Highly recommend to someone just getting into Irish whiskey. I absolutely LOVE this whiskey! It is smooth, goes down very easy and is great neat. I loved it so much I am ordering another bottle. A great staple to add to your bar. Ok if "young & sweet" hits the spot for ya'. Heavy vanilla bean and almond in nose and lighter of aforementioned on palette. Finish too short, too soft, and lacks the charred or peat fiery finish I personally desire from being a spoilt Scotch whiskey fanatic. For the money, I'd always head to the consistently nuanced and sophisticated finish of a 12yr Glenlivet. That's my two cents and tongue at play anyways. Sidenote: I must say that I do love the name Uisce Beatha (ish-kas ba-ha-ha), "water of life" in Gaelic. So true a description for a single malt 12yr+ scotch whiskey - sadly not so much for this softly blended not-yet-ripe Irish whisky. Loved this whiskey. From the crisp introduction of sweet, malty flavor's that immediately hit your palate, to the smooth, oak aged, chocolate vanilla blend finish, this is an all around anytime sipper and one of my personal favorites.